We’re going to go ahead and say it so that you don’t have to: cleaning stinks. There is a rare breed that takes therapeutic enjoyment in cleaning, but for the majority of residents of ROSS’ apartments for rent in Laurel, cleaning is a timely task that falls to the bottom of the to-do list. 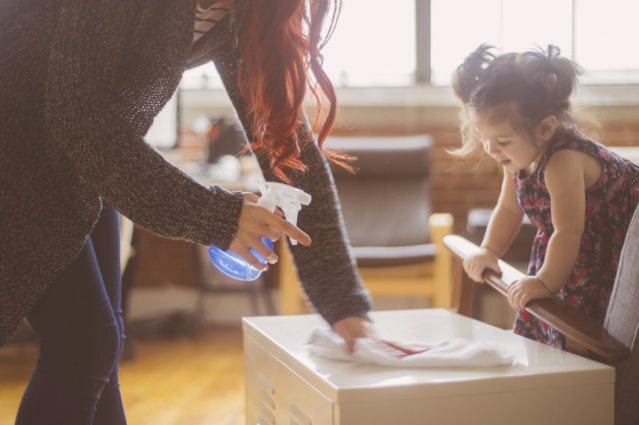 Eliminate the empty promise of scheduling a time to clean and commit to never letting your Laurel apartment get messy by easily sliding these five simple cleaning hacks into your daily/weekly schedule. Create a space by your front door for family and guests to leave their shoes upon arrival. This will eliminate the need for constant vacuuming, as their messy shoes won’t be carrying dirt throughout the house. Do not be afraid to throw useless things away – the more you have, the harder it is to maintain and the messier your apartment in Laurel, MD will feel. Sort and throw away junk mail as you get it, donate clothes you haven’t worn in years, etc. This daily ritual will set the stage for a clean, organized and productive day! Keep your sink clear by quickly rinsing off dishes and putting them into the dishwasher immediately after each use. Trust us, you will be surprised at how easy this is to adjust to! For example, cleaning the windows doesn’t need to happen weekly, but they are easy to forget about. Create a schedule of when you’ll be cleaning the larger items beforehand so that these timely tasks don’t pile up. Moving forward, take pride in your daily cleaning accomplishments by committing to any number of these simple tricks; but there’s no trick to finding an apartment community you can be proud of. It’s waiting for you right now in ROSS’ Laurel apartments.